Picture a four-year-old child coming with his mother to the pediatrician’s office for his annual well-child visit. In the course of the health check-up, the mother asks the care provider to speak to someone in the office about her son’s behavior, which is causing problems in preschool. As part of this conversation guided by basic screening questions, the provider learns that the parents are recently divorced, that there is a history of domestic violence and that the child’s behavior issues include tantrums, difficulty sleeping, hitting and refusing to leave his mother. The mother is worried that the child will be expelled from preschool and then she will have to leave her job to care for him. This scenario reflects how the difficulties a young child faces can affect that child’s experience and behavior in school and other environments, and how a routine well-child visit can be the time when a parent seeks help for these issues. Research in this area shows that stressors like the ones experienced by this child can affect not only behavior and school readiness, but physical health – including cardiovascular disease, diabetes and infectious illness. About five years ago, Rose Community Foundation’s Health Committee, along with the Child and Family Development Committee began to explore the topic of mental health care for very young children. Early childhood mental health is also sometimes referred to as children’s social-emotional development. Both committees believed it important to understand what early childhood mental health is, how a child’s mental health can affect his or her life and future and how to build prevention and early intervention into existing systems. Both committees also understood that collaborating with other funders interested in this area could work to make progress more quickly than if each funder worked in isolation. Research is also increasingly clear that mothers’ mental health during pregnancy and children’s early years is important. A recent two year grant to Colorado Access is one example of how research about maternal mental and social and emotional health is now becoming implemented in primary care settings. Colorado Access is a nonprofit health plan that provides children’s and pre-natal care for Medicaid patients. A Rose Community Foundation grant will fund a pilot project to implement a telehealth-based integrated care for pregnant and post-partum women at risk for depression. Telehealth delivers health care services through video-conferencing and other tools, which allows patients to receive high quality comprehensive care and monitoring at potentially lower costs. So, mothers-to-be who might not otherwise have access to mental health screening and monitoring will have regular access throughout their pregnancy and after, thus helping their babies come into a safe and healthy environment. Rose Community Foundation has also recently made a grant to the Children’s Hospital Colorado Foundation to support the First 1,000 Days initiative, which is concerned with children from birth through age 2. This comprehensive effort focuses on improving health outcomes for young children and families by screening regularly for mental and social stressors and then providing appropriate support and care if their personal circumstances are negatively affecting children’s health and well-being. The initiative is intentionally working and measuring change on five fronts: public awareness; policy and advocacy; provider training; screening, identification and care coordination; and targeted interventions. Both of these projects reflect the intentional integration of mental and social-emotional health screening and intervention into regular preventive health care for mothers and young children. 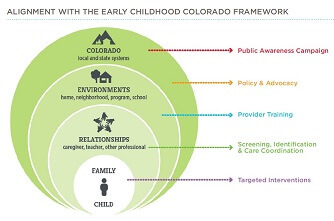 Both organizations – Colorado Access and the Children’s Hospital Colorado network – also have the potential to identify the most successful practices in this area and replicate them more broadly. Just as these efforts are spreading in the medical community, they are also gaining visibility both with funders and in the medical community. Connor recently co-authored an article about the collaboration of Denver funders in this area for The Foundation Review, a quarterly publication of the Johnson Center for Philanthropy. This article will help raise visibility both for the importance of early childhood mental health, and for the effective collaboration of funders in the Greater Denver community to address it.